I have the following scene. The bulbs are Hank and use the OOB Hank RGBW driver. 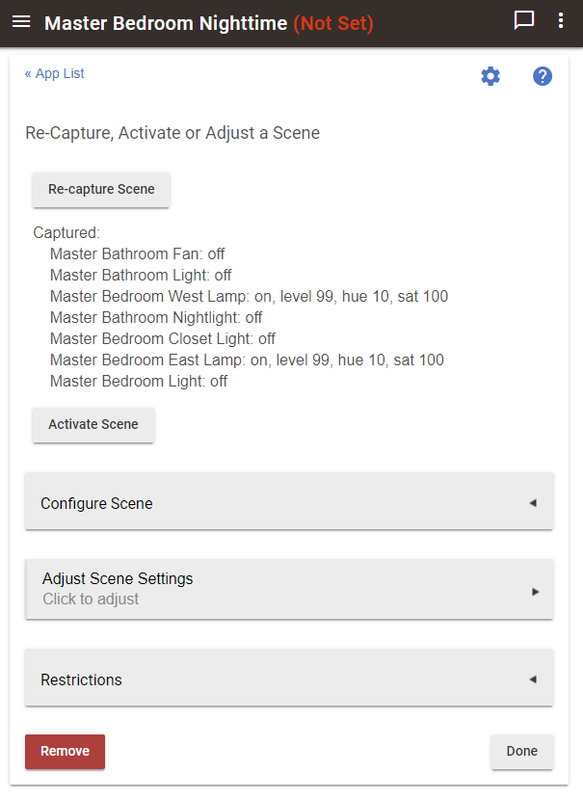 When the scene activates it successfully turns all of the lights off (and sets the bulb colors) but it doesn't turn the bulbs on. @mike.maxwell Is this a bug in the scenes app or in the Hank RGBW driver? easy for you to test, when the bulb is off and you set hue/color in the driver does it turn on? No, it doesn't turn on. Is it supposed to? I don't have any other RGB devices that I didn't write the device drivers for. I actually would prefer that setting HSL doesn't turn the bulb on though. It opens possibilities of adjusting it while it's off without turning it on (for example if you wanted it to follow a circadian cycle and you didn't want it to flash the two or more times a day that you adjusted it). Either way, from my perspective this test still wouldn't tell me what is broken I don't think. In the scene we don't just specify the hue and saturation. We also have fields to specify switch state and level. 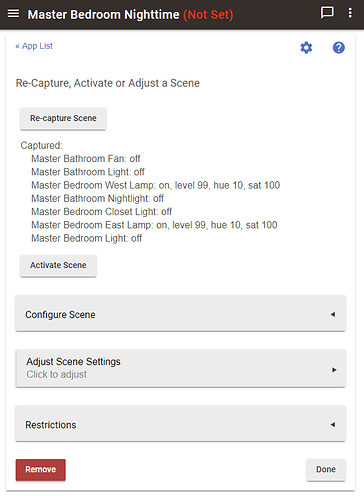 The scene app isn't doing anything with those values or if it is... the driver isn't sending them correctly to the bulb (because maybe the bulb can't consume them fast enough and needs a pause for example).